Sound "Clean and precise without chestiness or boxy colorations"  "presents a collage of sound that is vivid and exciting"; "the level of detail was inspiring"; however, "useable bass extension is to just below 70Hz -- just." Features Two-way speaker that uses a 5 1/4" woofer and the same titanium-dome tweeter found in pricier Axiom models; cabinet "is the same asymmetrical shape thats used for all the Axiom models," which "helps eliminate internal standing waves." Use "Has an interesting way of handling deep bass: it just doesnt do it"; but "so good within its range that it deserves to be married to a subwoofer that's its equal"; can't biwire or biamp the M2i. Value "Audiophiles pay big bucks for this type of sound, and this speaker was delivering it at a fraction of the price." Im hard-pressed to think of another speaker company thats made more progress in the last two years in the hotly contested budget-priced speaker market than Axiom Audio -- despite the fact that theyve actually been producing speakers for more than 20 years. In late 2000, their M3Ti speaker caught my attention with its truly high-end sound at an incredibly attractive price -- $275 USD for the pair. Sonically that speaker destroyed some speakers that were many times its price. The M3Ti (later replaced by the identical-sounding M3Ti SE) wasnt Axiom's lowest-priced speaker, but what the M3 speakers signified was the entry point into the Axiom world for serious audiophiles. This was mainly because they had a better tweeter than the Axiom models priced lower, and this made speakers like the older M2Ti SE, with its "hybrid" tweeter, kind of an oddball (although that tweeter did sound quite good too). See, for the price of only two movie tickets and parking, you could forget the M2Ti SE and move up to the M3Ti SE and get a bigger cabinet, bigger woofer, and, most importantly, that better tweeter used for all the Axiom speakers up to the $1100-per-par M80Ti SE. Who wouldnt want that? Someone who wants to save the price of those tickets and parking, thats who. So when company president and main designer Ian Colquhoun set out to update some of his speakers, he also set out to lower the price of admission to the Axiom world. The M2i is based on the now-discontinued M2Ti SE. Cosmetically, its almost identical to the older model. The most noticeable change is that 1" titanium-dome tweeter. It alone has made the oddball into a regular player, and it was a significant-enough change that the company decided a new naming scheme was appropriate -- no more Ti or SE, just i along with a slight increase in price to $255 per pair, up from $240 for the original M2Ti SE. You no longer save the cost of parking. The aluminum-cone woofer driver is still 5 1/4" in diameter. The same acoustical design philosophy that went into the other Axiom speakers goes into this one, but Ian Colquhoun aimed at achieving even better performance. Colquhoun has been involved in speaker design since before the time of Floyd Tooles research at Canadas National Research Council. As a result, on- and off-axis amplitude responses are crucial to his design process. Colquhoun told me that hes very proud of the M2is design because he achieved something more "linear" (i.e., flat) than the M3Ti SE, and that makes its performance more comparable to the M22Ti SE. Axiom developed a new crossover for the M2i that blends the woofer with the tweeter at 2.7kHz. This is a bit lower than the M3Ti SE, which was up in the 3kHz range. In terms of bass extension, Axiom knows that the M2i isnt a full-range speaker or anything near it. This is still a small-woofer, small-box speaker. Useable bass extension is to just below 70Hz -- just. The 11 1/4"H x 7 1/2"W x 8 1/2"D all-MDF cabinet of the M2i is still smaller than the M3Ti SE's, but it is the same asymmetrical shape thats used for all the Axiom models. View the speaker from the top and youll see that the back wall is substantially narrower than the front baffle. This helps eliminate internal standing waves. Axioms patented Vortex port flanks the top rear. 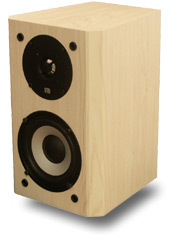 Fitnfinish are the same as with all the Axiom speakers, and I have no quibbles about them given the price. The binding posts on the back are of high quality (single set, no biwiring) and the speaker comes in black, cherry, and maple finishes. The M2i weighs only 10 pounds and can be tossed into place with just one hand. The warranty is the customary five years, and if you deal with Axiom factory-direct, you will have a 30-day satisfaction policy to fall back on. The M2is were used with some of the best "sanely" priced integrated amps Ive come across. The 100Wpc Arcam FMJ A32 proved a wonderful match, as did the high-powered 200Wpc Perreaux 200iP. These are both overkill amps, for sure, but given the high performance of the M2i, they do show all it can be. Axiom says the M2i's sensitivity is 87dB and its impedance is about 8 ohms. This is pretty normal for a speaker of this design. Id say most good-sounding moderately powered amps should do just fine with the M2i. I used the Arcam CD23T CD player, and all cabling was by Nirvana Audio. I sat the speakers atop my 26"-high Osiris stands with the usual setup of about two feet to the side walls and five feet behind. I wanted to hear what this small speaker was capable of on its own, so I kept it away from boundaries that would artificially boost the bass. I was stunned the first time I played Bruce Springsteens The Ghost of Tom Joad [Columbia 67484] over the M2is. These speakers are clean and precise without chestiness or boxy colorations. Bass is obviously lacking, something Ill expand on later, but the image hovered in space solidly, and the level of detail was inspiring. Audiophiles pay big bucks for this type of sound, and this speaker was delivering it at a fraction of the price. Whats more, except for the bass, the M2i sounds even better than the M3Ti SE to my ears. Salif Keitas Moffou CD [Polygram International 16906] is incisive and articulate-sounding, and its rendered through these speakers with wonderful clarity and precision. The instruments and voices leap to life from the mix, and there is see-through transparency that's usually reserved for speakers $1000 and up. Female vocals dont quite soar to the levels that they can out of the reference-class Amphion argon2 and Revel M20 -- speakers far in excess of $1000 per pair -- but the performance here is similar, and thats quite an accomplishment. Scratch that -- its almost a miracle. The M2i doesnt hold back -- it presents a collage of sound that is vivid and exciting, and its level of neutrality is astounding at the price. The M3Ti sounded great, but it never sounded this exact, and thats why I think the M2i sounds better. In my experience, the entry point to this type of refined performance recently dropped with the introduction of the $500-per-pair Energy Connoisseur C-3. The M2i cant match the bigger C-3s bass extension or overall output, but its sound is similar and, of course, almost half the price. If you are used to hearing speakers like the Energy Connoisseur C-3, Revel M20, Amphion argon 2, and Ethera Vitae, then youll understand how the M2i presents itself. Its extremely exact and precise. But if you like things a little more laid-back, relaxed, and distant, then the M2i, along with those other speakers, will likely sound a little too up front, perhaps even a little lean. The M2i's high-frequency performance is identical to that of the M3Ti SE and M22Ti SE, which is not surprising because they all use the same titanium tweeter. This is a good-sounding drive unit -- "way too good for the price," as one friend always likes to say. Nicely recorded acoustic instruments such as those on Ani DiFrancos Not a Pretty Girl [Righteous Babe Records RBR007-D] show how pristine and refined the M2i sounds. The double-the-price C-3 edges it in sweetness, but the low-priced M2i is still darn good. Soundstaging, as with the other Axiom bookshelf models, is noteworthy and definitely far and above a flat-as-a-pancake presentation. The M2i's is a true high-end presentation with width and depth. In my room, it even outclassed the C-3 in terms of image specificity and the size of soundstage. The instruments and voices float in space, perfectly delineated. Where the recording allows, the stage stretches around and behind the speakers. This speaker performs like a true minimonitor, with emphasis on monitor. The M2i has an interesting way of handling deep bass: it just doesnt do it. This is similar to the way Polk Audios LSi7 and LSi9 speakers sound and is in contrast to the way the M3Ti SE goes about things. Like the Polk LSi bookshelf-sized models, the M2is do what they can do with tightness, control, and articulation and then disappear -- hit-and-run speakers, so to speak. Within the M2is limits, drums sound tight and controlled, and the low end of a piano is clean, clear, and vibrant. 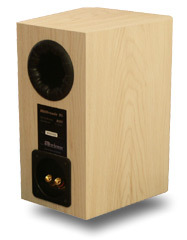 Its not big and robust bass -- there is only a 5 1/4" woofer after all -- but its good in a small-speaker kind of way. However, when something comes along thats too deep for the M2i to reproduce nicely, it dodges these potentially lethal deep-bass attacks like a prizefighter -- a quick slide to the side and they go by, unheard but not unnoticed. This M2i is so good within its range that it deserves to be married to a subwoofer that's its equal. So I did the unthinkable: I matched the pint-sized M2is with Revels big Performa B15 subwoofer. Granted, no one in his right mind would match a more-than-ten-times-the-price sub to a speaker the price of the M2i -- something like one of Axioms EP-series subs is more in line -- but I did it because the B15 is as close to state-of-the-art subwoofing as many people will want without having to sell a car or rent out part of the house. Plus, it has remarkable flexibility for matching perfectly with satellite speakers. And the remarkable M2i speaker showed just how good it could be with the low end now intact. This little speaker matched purrfectly with the B15, and it suddenly sounded big. I was so enthralled by the sheer output capability that I brought out Telarcs explosive Carmina Burana [Telarc CD-80056]. Im pretty sure that the little old ladies that live nearby in my apartment building were shaken when the bass was driven home. The B15 is remarkably tight and articulate, and having that extra bass didnt just add impact; it added to the sense of spaciousness that was missing before. I was awash in a stage with amazing width and depth. As for the other stuff I'd been listening to, Ani DiFranco's Like I Said (Songs 1990-91) [Righteous Babe Records RBR005-D] is recorded rather poorly and is rather lightweight-sounding with too much high-frequency hash -- obviously, a subwoofer's not going to change that -- but now there was bass energy that helped balance things out. The already robust The Ghost of Tom Joad gained some additional weight, and that resulted in an even more majestic sound with an increased sense of space. Norah Jones piano on Come Away with Me [Blue Note Records 32088] had the sort of richness and vibrancy that I knew was there but was absent when the M2i was on its own. The bass guitar and drums were fleshed out so wonderfully and with such detail and control that I could do nothing but sit back and enjoy this speaker system -- a $255 satellite and a $3000 sub! This Axiom/Revel marriage sounded similar to the excellent $5500 Ethera Vitae loudspeakers that I recently reviewed. The Ethera is still a bit more refined and articulate in the upper end. And it also has a little more see-through transparency -- obviously there is room for improvement in drivers and cabinets beyond what this little Axiom costs. But both systems share a clean, clear, open, uncolored, and "boxless" sound. These put into perspective just how much the M2i achieves. Its an inexpensive, micro-sized super-achiever. The M3Ti SE, with its 6 1/2" woofer, goes deeper, and as a result is a little weightier-sounding than the M2i. Because of that, its actually closer to being the perfect all-around, low-priced bookshelf-sized speaker because it stands alone easier. Its caveat is that its not as neutral as the M2i. The mids of the M3Ti SE are a bit more relaxed, and that means that voices dont jump out at you quite as much. The overall presentation from the M3Ti SEs tends to be a little on the warmer side, while the M2i is a little leaner. Thats precisely why Axiom says that the M2i has more in common with the $400 M22Ti SE than with the M3Ti SE. Both the M2i and M3Ti SE play to about the same volume level, but when the M3Ti SE starts getting taxed, the woofer loses control and some port chuffing can be heard. It tries to do more down low, and its failure is more obvious. The way the M2i handles deep bass is by simply not doing it. Still, it gets stressed when played too loud, which manifests itself as some hardness and congestion in the upper bass and lower mids. In the end, each speaker can only play so loud, which is reasonably loud in even moderate-sized rooms, but the effects of the speakers hitting their limits are a little different. Which speaker you should choose will depend on various factors. As I mentioned, the M3Ti SE and M22Ti SE are rather full-sounding speakers. If you are not a bass freak, you can easily get away with no subwoofer with either of these speakers. The M2i, though, is light down low and falls into the just acceptable range of bass performance. That makes for the next biggest difference. When I played the robust-sounding The Ghost of Tom Joad I was surprised at just how rich and vibrant the M2is sounded. However, when I played something a little less forward and full, they sounded a bit thin. A good example of this is Ani DiFranco's Like I Said (Songs 1990-91), due to its inherently lightweight sound and excessive high frequencies. All the Axiom bookshelf speakers can benefit from subwoofer reinforcement; its the M2i that begs to be mated with one -- and not just because it has the least extension. The way it rolls off in the bass seems to make it the easiest to match to a sub, and this highlights its prime advantage over the other two Axiom speakers if you choose to go that route. Axiom has scored big-time with the M2i. It's every bit the winner the M3Ti SE is, but in a different way. The M3Ti SE set something of a standard for producing stellar overall sound at a reasonable price, and that fact still remains. The M2i doesnt have the bass to be an all-around high performer, but within its limits, it achieves a remarkable level of neutrality for an insanely low price. This is an amazing little speaker that makes its mark by doing what it can do well and then leaving the rest (deep bass) to something else. I suspect that the M3Ti SE will still be favored by those wanting a great standalone speaker and not wanting to be bothered with a sub. The M2i, though, will be the companys shining star for someone who wants more of a monitor-type speaker -- one that's extremely revealing and neutral -- and who can forgo any real bass or, preferably, will match the M2i with a subwoofer. The latter option makes the M2i part of an upgradeable system that may well result in extraordinary full-range sound at a very affordable price. Price: $255 USD per pair.